The Summer Season Has Arrived. Yes, it is official, the summer season and the tourists have arrived. 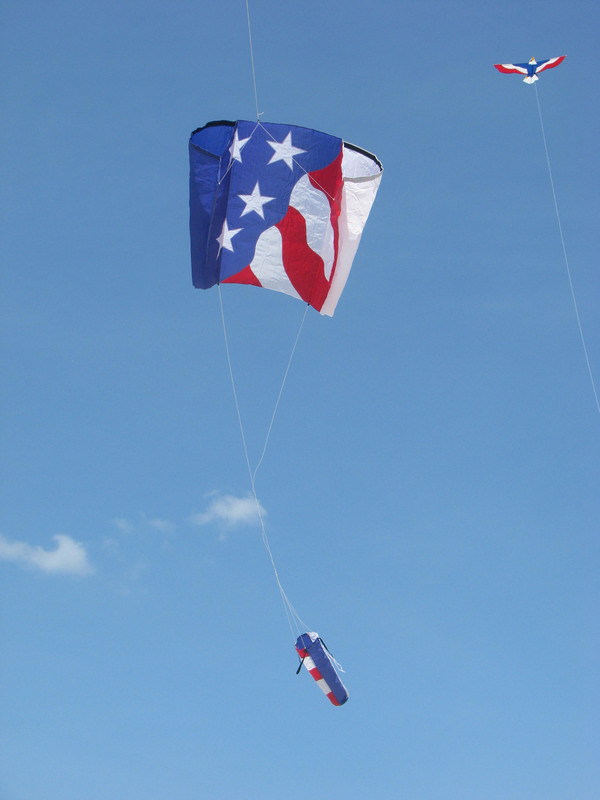 We went out to Fort Macon State Park for the weekly kite club fly. 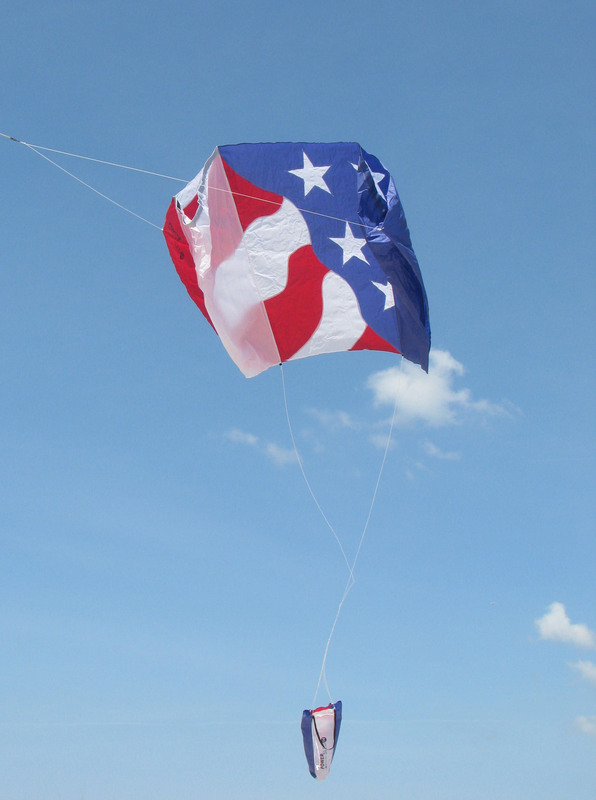 The plan was to fly only red-white-blue kites for Memorial Day. We went especially early as we knew traffic would get crazy later. And, boy, were we right. The parking lot was already about half full when we got there and people kept streaming down the walkway to the beach. A larger than normal number of fishermen were arriving, too. As per usual, the winds were extremely light. That seems to be the curse of the Sunday morning. The large Premier powersled wouldn’t fly. Though not for want of trying. We didn’t even try the double-box delta. What did fly was my original Joel Scholz Eagle. It took a little work but once it was high enough, it sat in the sky. I also tried to get up the Eagle parafoil I built several years ago. There just wasn’t enough wind. 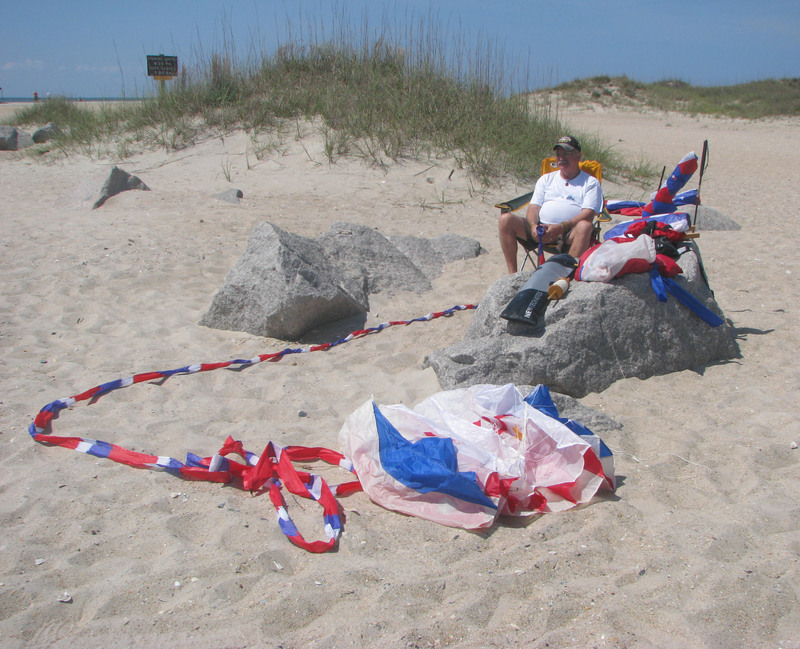 So most of our red-white-blue was left sitting in the sand. Just on a lark, we got out the smallest powersled. Again, it took some work but it did fly for a while. Because of the low, gusty winds, the kite had to be attended every minute but that was no hardship. At one point the wind dipped and the powersled dove for the sand. Just before hitting, it flipped and climbed again. Funny thing was the sled had turned upside down and, against all logic, was flying in that position. Apparently the tunnels and the sail were able to contain just enough of the wind to maintain lift. After about two hours, we decided it was time to go home. Traffic going into the parking lot was backed up the road. The park rangers were acting as parking attendants, keeping traffic moving and finding open spaces for the new arrivals. The signs were out at the swimming beach that the “Lot was Full”. The parking lots at the primary Atlantic Beach, NC water access were also full and the traffic coming on to the beach was bumper-to-bumper. We were leaving at the right time. yep, the beaches will be getting crowded…… we have an event 6/13 on our beach, this is the 12th year!!! I’ll be at a wedding on the 13th. I’d rather be flying at your event. We’ve been trying to fly in the mornings to avoid the traffic. The wind has not been cooperating. Our festival is in October, after the tourist season ends but before the winter weather sets in. Have fun at your event and I’ll send good thoughts for great winds.